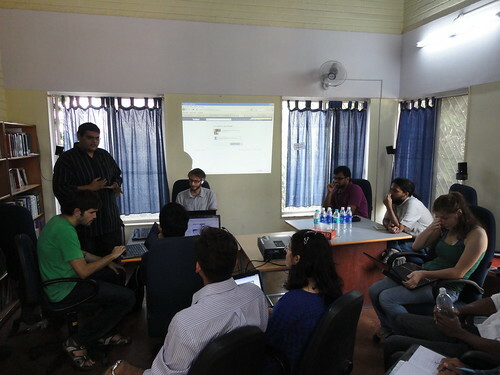 Earlier this month multiple Facebook users gathered at the Centre for Internet and Society, in Bangalore, to participate in a workshop dedicated to Facebook Resistance. 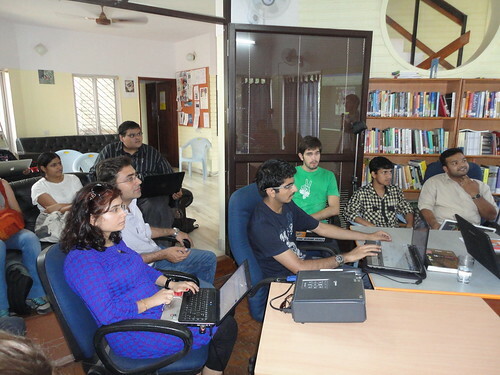 They were given an on-site opportunity to go beyond the laws and constraints of FB’s software. After the participants experimented with browsers hacks to locally modify Fb, the conceptual space of counterprotocological control was explored in unrestrained discussions and brainstorms. Facebook Resistance is a research initiative accepting the status quo of Facebook being the dominant social identity management system, researching on the ways to change its rules and functionality from inside the system. Facebook sets the rules of how-to behave, so we’re asking: Are we happy with their interface, features and rules or do we want to change them? A change can be as trivial as adding a background-image. Early online networks like Geocities enabled users to entirely modify their online presence, and even encouraged them to learn HTML, whereas Facebook is only designed to perpetually feed ‘User Generated Content’ into the system and implement new forms of cognitive capitalism. This creative intervention is all about challenging and bending the rules to make the best out of the book we never finish reading. We are slowly questioning and undermining the system. Accumulating critical, subversive and funny concepts from Facebook users in workshops which -in a later stage- might be actualized in a software developed by the Facebook Resistance. While travelling in India I stumbled upon Anne Helmond’s blogpost. Reading about the project was like a calling to team up with the resistors. Having researched the potential of browser hacks in my MA thesis last year, conducting a workshop in India was truly and exciting endeavor. Moreover, the ultimate combo of the two types of resistance I earlier shed light on. Web designers, coders, privacy advocates, new media researchers, a law student, critical Facebook users and even a few marketeers. Its was a very mixed and committed audience. “I’m here because I hate Facebook”, said one of the participants that did have an account. Indeed, quitting and joining an Open Source alternative -you won’t find your friends on- cannot be the only option if you hate FB. Augmented browsing can change the entire FB experience. Perhaps, then, it is a way to turn hate into love? We tested the dislike button and someone wondered if the feature wouldn’t just lead to hate campaigns and harm youngsters. But as Nishant Shah, research director at CIS, immediately pointed out: “Facebook is not a utopian space to begin with.” (If you don’t understand why, please continue reading here). Generally, the participants liked the idea of ‘disliking’; bringing counterbalance to the overly positive and pervasive like button. Other things we did: adding background images and colours, removing the sidebar (yes, the one with useless suggestions and ads), unfriend each other and get notified, change and remove the logo, set a FB time-limiter and doing some Web graffiti. It was great fun. Sharing ‘with privacy’, anonymous browsing, an augmented commenting space, security, identity theft, scriptblocking and likejacking; the workshop audience brought some great topics and technologies to the table. -The ability to make money by placing your own advertisements on your profile: ‘Paid immaterial labour’. -Managing multiple personas through one single FB account. -More ways and gestures to express various emotions (à la We Feel Fine ). -Creating a comment structure that is more suitable for discussions. 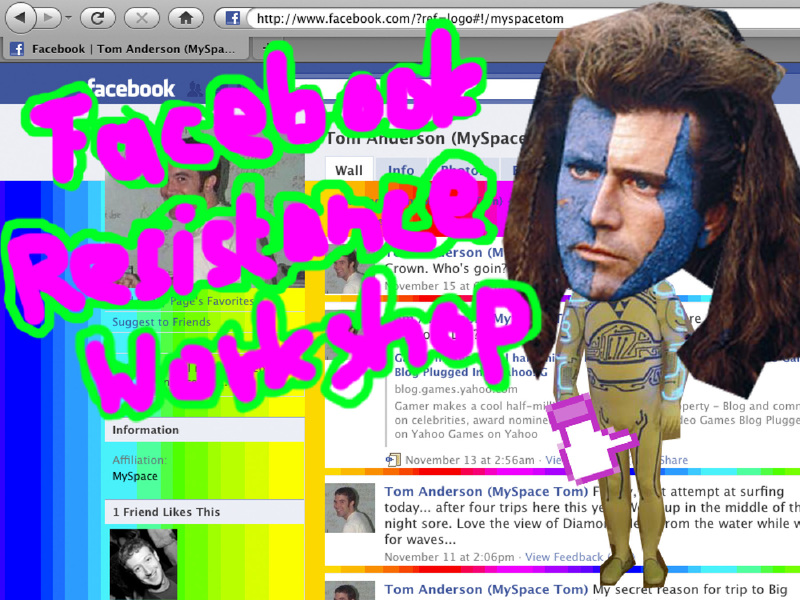 After Berlin, Barcalona and Bangalore the Facebook Resistance workshop is coming to Amsterdam on the 22nd of April at Mediamatic. If you are in town and interested in becoming an ‘architect’, don’t miss it! Read more about FB Resistance in an interview by Time Out Bangalore. And, while you’re at it, check out Face to Facebook by Allessandro Ludovica and Paolo Cirio, in case you haven’t yet. They are presenting their work at the medialab exhibition “Chilling effects” at Tetem, in Enschede on the 21th, one day before the FB workshop!